This is the last in a three-part series on youth and AIDS in Africa. KAMPALA, May 7 2014 (IPS) - Every morning at six a.m. before he goes to school, and every night at six p.m. after he gets home from school, Emmanuel, 11, knows what he must do: take his antiretroviral pills. “They are very sour,” says the shy and gentle boy, who was born with HIV and is cared for by his elderly grandmother, his parents having died from AIDS when he was one year old. “But I don’t mind taking the medicine. I’m used to it now,” he told IPS. Emmanuel may be taking his medicine properly, but for many of the 35,500 children in Uganda on HIV treatment, daily ARVs are too much of a bitter pill to swallow, especially if they don’t understand why they need them. The Young Lives study presented by Ugandan researcher Rachel Kuwuma at a conference in Cape Town in December found that not knowing why they needed medicine was a big reason for non-adherence in young people. “At first I didn’t know why I was taking drugs and didn’t put much effort into it so sometimes I would just throw it away…in the toilet,” Mika, 11, is quoted in the research, which looked at HIV-positive children in Uganda and Zimbabwe over two years. In Uganda, in 2012, just one in three children who needed ARVs received them, according to United Nations data. 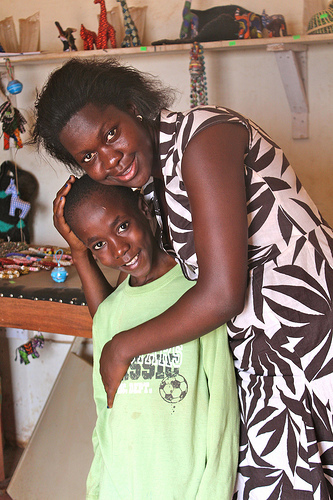 Cathy Kakande works for Namugongo Fund for Special Children, a Ugandan group providing Emmanuel with the drugs for free. She is also a counsellor to the boy and his grandmother. Kakande told IPS that Uganda’s policy is not to reveal their HIV status to children until they reach 13 years of age. But children will be children, and Dr. Edward Bitarakwate, the Uganda director of Elizabeth Glaser Paediatric AIDS Foundation, says not knowing can lead to a child refusing to co-operate. “Some types of medicine taste horrible and if you’ve not told the child that they have a chronic condition that needs to be treated, that can be a problem,” he says. Some children living with HIV are told by their carers they have tuberculosis (TB) and other diseases. “The child is, like, ’man, this TB, I’ve read about it, I can’t have TB for five years,'” Bitarakwate tells IPS. In Uganda, like in many other African countries deeply impacted by AIDS, children’s drug taking is commonly mediated through carers. If a parent, sibling or guardian is discriminated against or fearful of being shunned for being HIV-positive or having an HIV-positive child, they may be reluctant to give ARVs or not be open about it. This is but one of many reasons why the scale-up of ARV treatment in Africa is leaving children behind. In 21 high-burden African countries, only 34 percent of eligible children received ARV therapy compared to 68 percent of adults. “Some mums don’t want to be seen carrying a shopping bag full of medicines,” says Bitarakwate. Like the virus, self-stigmatisation can be transmitted: “The child grows up and finds out ‘I’ve got this terrible disease and my parents won’t even tell me about because it’s a bad thing’,” says Bitarakwate. Emmanuel’s grandmother fears telling her neighbours near the Kampala house she rents about her HIV-positive grandson, says Kakande. ARVS on an empty stomach can cause nausea. Lack of food is listed as one reason why children don’t take drugs in the Young Lives study. Other factors are not knowing the reason, fear of being seen by others, fear of being scolded, failure to meet expectations of adults, and loss of hope in life among children repeatedly ill. The study concluded that adherence problems in children were commonly shaped by their social context and implicate their carers. “One very, very common challenge” that this and other research ignore is the influence of Uganda’s born-again, Pentecostal churches, says Jacquelyne Alesi, programme director of the Uganda Network of Young People Living with HIV/AIDS. Emmanuel has two more years until he officially learns that he has HIV. Dr Solomie Jebessa, a senior technical advisor at the African Network for Care of Children Affected by HIV/AIDS (ANECCA), says the consequences of children not taking their medicine properly can be fatal because the disease progresses much faster in children compared to adults. “We’re losing a lot of children before getting them into the healthcare system,” she tells IPS. Stigma can be equally, if not more devastating than the virus, says Dr Jebessa, who has worked with HIV-positive children in Uganda and Ethiopia. From her experience, school clubs and activities where young people facing the same challenges can interact are crucial.